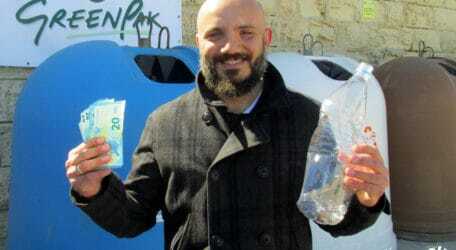 Malta’s leading recycling cooperative, GreenPak, has extended its popular Crush & Win campaign to household collection and upped the prize to €500. To be in with a chance to win €500, all participants have to do is crush their recyclable items, place them in the green recycling bag, insert a piece of paper with their telephone number written on it and leave it on their doorstep on a designated collection day. The Crush & Win campaign has handed out over €15,000 since it was launched last year but was limited to entries deposited at bring-in sites before GreenPak decided to extend the scheme to household collection. GreenPak also recently took part in a related campaign at the Farsons Beerfest, which collected over 620kg in plastic bottles and 2,000 caps in just 10 days. With the support of the Farsons Foundation, GreenPak and Zibel came up with PlastiKAXXA – whereby patrons at the Beerfest were able to dispose of their crushed plastic bottles and cups in seven containers made from re-used nets and wood that were dotted around the site. A daily prize of €50 was awarded by GreenPak to lucky PlastiKAXXA participants on each day of the Beerfest, in an extension of the cooperative’s Crush & Win campaign which encourages the public to crush recyclable items before disposing of them responsibly.